On Monday, in its first opinion of the 2010-2011 term, the Michigan Supreme Court affirmed that decision, but with a different analysis. parent loses any entitlement to the “custody, control, services and earnings of the minor . . . .” Because nothing in the language of MCL 712A.19b affects the duty of support articulated in MCL 722.3, the obligation remains intact. Thus, even after a parent’s rights have been terminated, the obligation to support continues “unless a court of competent jurisdiction modifies or terminates the obligation . . . .” This provision of MCL 722.3 indicates that a court has the discretion to terminate or modify a parent’s obligation to provide support, but is not compelled to do so. 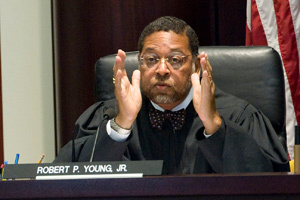 Six of the justices signed the opinion, which was penned by Justice Robert P. Young Jr. Justice Alton T. Davis recused himself because he was on the Court of Appeals panel that decided the case in March. Michigan Court of Appeals Judges E. Thomas Fitzgerald, Mark J. Cavanagh and Alton T. Davis, exercising remarkable judicial restraint in Sharp v. Dep’t of Corrections, when affirming dismissal of a pro per prisoner’s $19 billion wrongful-imprisonment claim. Archie Sharp, who’s serving a 30- to 110-year term, sent a letter to his warden, Kurt Jones. Sharp’s missive, styled as a “Private Agreement,” demanded $1 million for every day that he was being kept in the pen. By its terms, the document was “self-executing” and would become effective if [Jones] allowed a five-day period to expire without responding. A claim like Sharp’s can be fertile ground for clever appellate judicial zingers. But Judges Fitzgerald, Cavanagh and Davis resisted the temptation placed before them. Instead, they patiently explained that the “agreement” lacked mutuality, did not fall under the UCC and did not present a claim for account stated. And that, folks, is a fine example of a class judicial act.